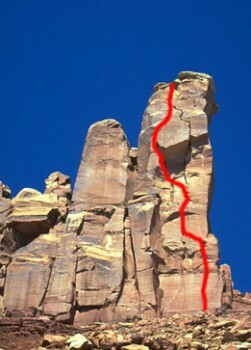 Lightning Bolt Cracks is not only the best route to one of the best desert towers, it would be a great climb anywhere. Excellent rock and the full variety of crack climbing—from fingers to chimney—highlight the climb. The crux is right off the ground, though the top of the first-pitch crack is tough, too. After that, Lightning Bolt has the bonus benefit of looking harder than it is—although it’s pretty hard! Which SuperTopo guidebooks include a topo for Lightning Bolt Cracks?